Like var, you’ll use let to create variables (not constants). You might be wondering why we need two ways to create variables. Well, let differs from var in one very important way: let is scoped differently from var. Let’s take a closer look at what that means. 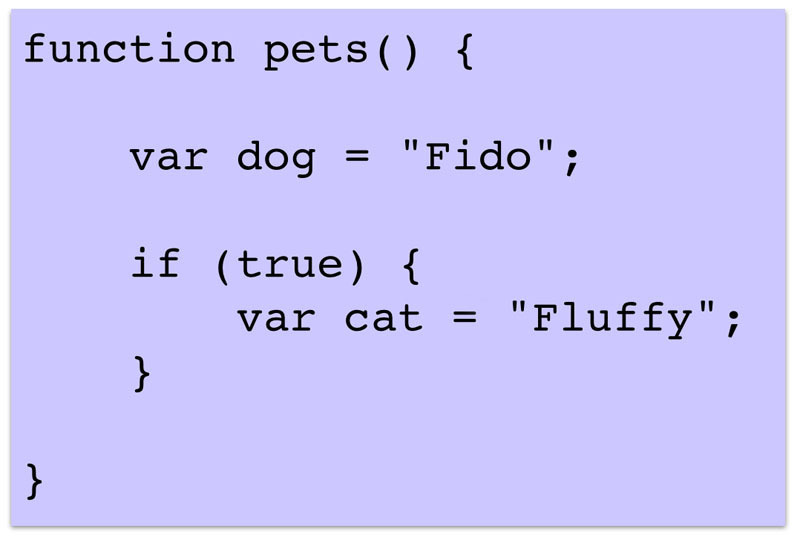 That means that the cat variable exists in the line above where you declare it! We know it exists because we don’t see a reference error. In this example, the variable zebra really doesn’t exist at all, so we see the reference error. Notice that the declaration of cat is moved up above where we’re using cat. It’s not being initialized, which is why we see undefined as the value for cat when we display it in the console, but because the declaration is above where we use it, we don’t get a reference error. Notice here that even though the if block is never executed, when we display the value of cat in the console, we get undefined and not a reference error. Again, this is because var has function scope, not block scope; a bit weird for anyone used to a language like, say, Java. Now, we cannot access the variable cat outside the block in which it’s declared; when we try, we get a reference error. When you declare a variable with let, it does not exist until the line of code where you declare the variable is executed. When you declare a variable with let inside a nested block, that variable has block scope: it is not visible or accessible outside the block in which it is declared. 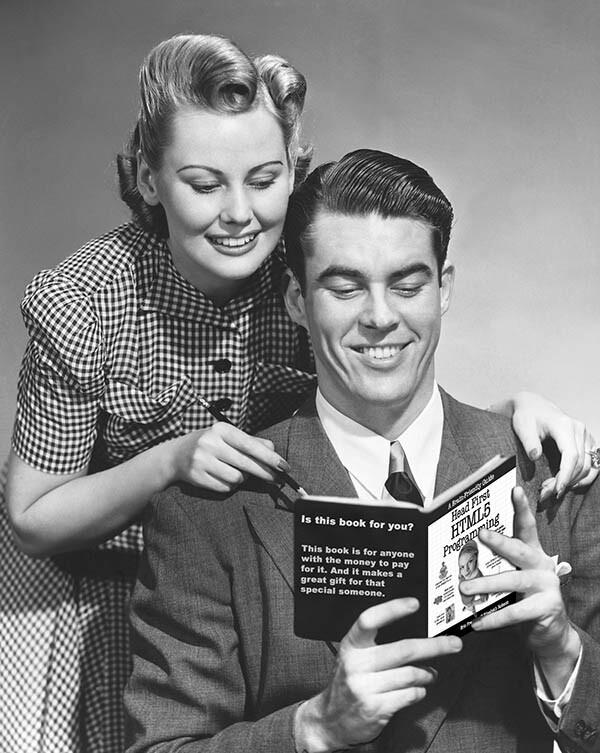 In the first for loop, we’re declaring a variable i to use as the loop variable. But as you might guess, the scope of i is the entire function, not just the for loop because we’re declaring it with var. That means i is accessible after the for loop block has completed. So where we attempt to display the value of j after the loop block has completed, we get a reference error. First, we set up a click handler for the <button> in the page with the id “button”. We then use a for loop to create three new <div> elements, and add each to the page by appending it to the <body> element, which just adds each new <div> to the bottom of the page. We give each <div> an id based on the string “div” and the current value of i, so the first time through the loop, the new <div> we create has the id “div0”; the second time through the loop the new <div> we create has the id “div1” and so on. 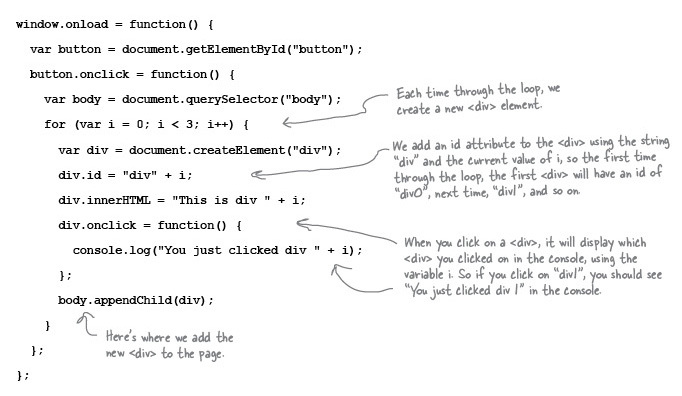 We also use the value of i to set the text of the <div> which you can see in each <div> on the page. All that works fine. We also set up a click handler for each <div> element, so that when you click on a <div> it should display “You just clicked div ” and then a number depending on which <div> you clicked on. So if you click on the <div> with the id “div0”, you would expect to see “You just clicked on div 0” in the console; for “div1”, you’d expect to see “You just clicked on div 1”, and so on. (To try this yourself get the code from github). Now, the code is working perfectly! One small change makes all the difference in the world… So how does it work? So, when you click on a <div> element in the page, the value of the free variable i is looked up in the closure, and this time, it’s correct. It’s correct because each closure captures the individual block scope that was created for that one time through the loop. 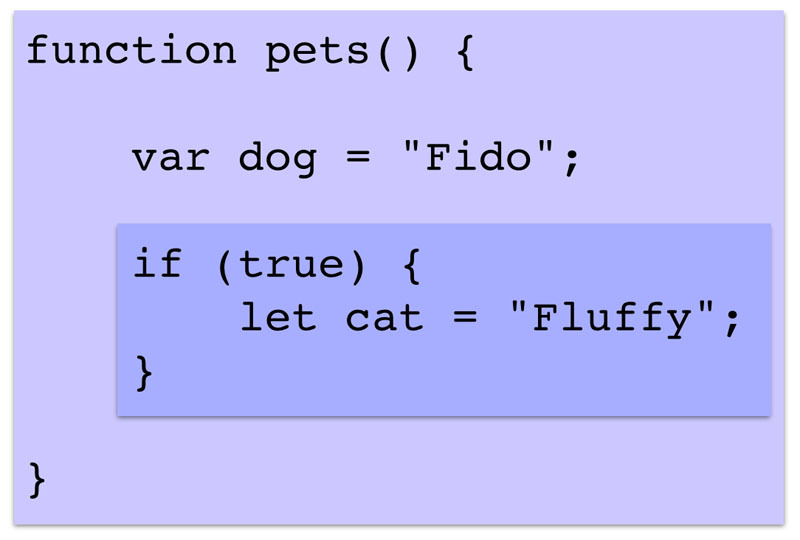 Now, sometimes you might want the environment for the closures you create in a function to be shared, like when we used var to declare i, but sometimes you’ll want each closure to have a separate environment, like when we used let to declare i. 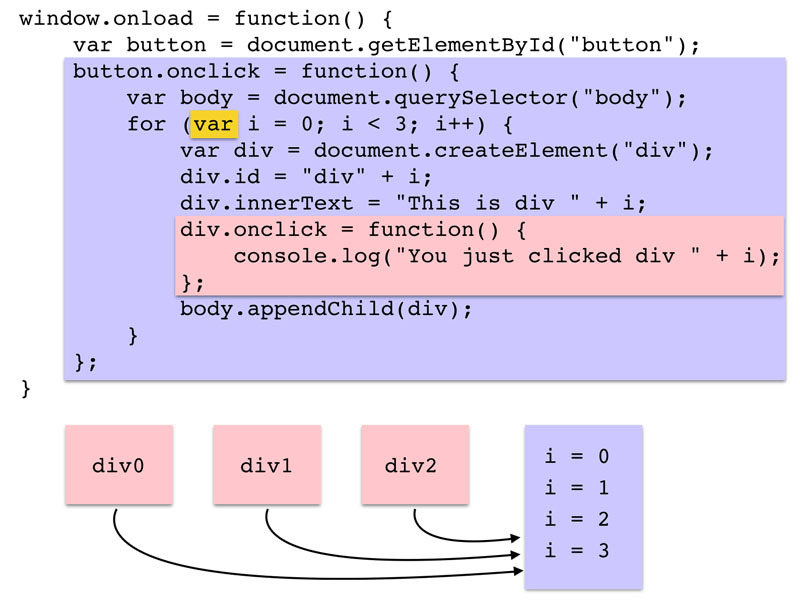 Now you know how var and let work, and how closures work, you’ll be able to make an informed choice! And, just to link back to the previous post again, note that const is scoped the same way as let. 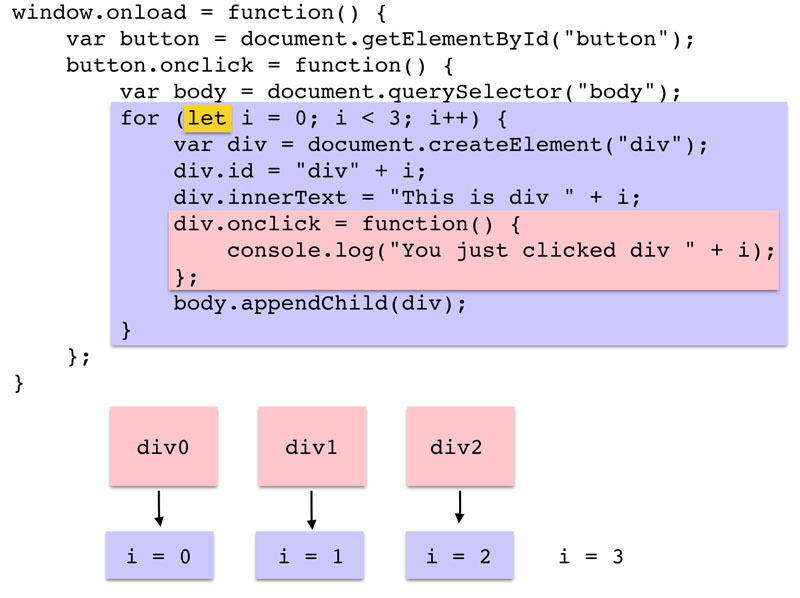 Keep in mind that let is not fully supported in browsers yet (as of this writing). Keep your eye on the ECMAScript 6 compatibility table for browser support in the future, and in the mean time you can use a transpiler, like Traceur to translate your code that uses let to ECMAScript 5 code that simulates let (and does so remarkably well!). To use Traceur, all you have to do is link to it in the <head> of your document. Check out the code for the let example on github to see how to do this.